Watering garden beds appropriately can be a challenge. 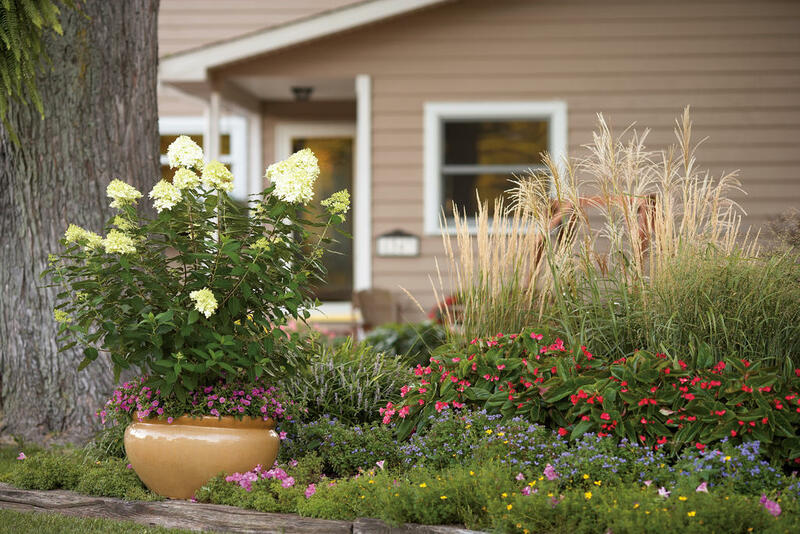 This article explains the basics of watering landscapes. After all the trips to the garden center have been made, and all of the flowers and vegetables have shifted from pot and pack into garden bed, many gardeners feel that their work is done. Now is the time to sit back and enjoy the fruits of your labor. This statement may be true for the first week, but then reality hits, it’s time to water! Years of helping and talking to gardeners about all sorts of problems, have convinced me that there are 2 different types of gardeners: those who like to water and those that don’t. It doesn’t make much difference whether the amount of effort involved with watering is a three hour tango with a hose or a 3 second walk to the irrigation module that controls your pop-up sprinklers, gardeners tend to fall into these two categories. To some watering is a chore, others a Zen-like activity, to many others it is a time of anxiety and fear. Many dollars and countless hours are on the line every time the hose needs to be put into play. We already have two outstanding articles that address watering container gardens on the website (“Water Your Way to Happy Plants” and “Wait! 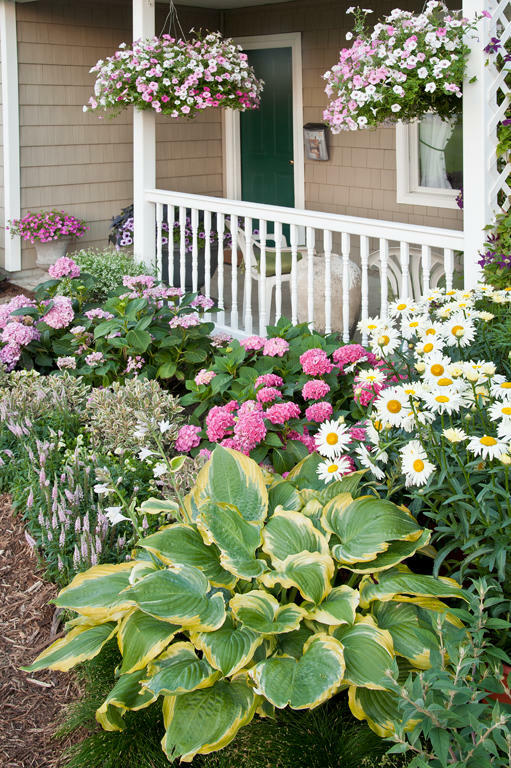 That Plant is Drowning!”), so this will discuss the ingredients that are necessary to take the fear out of watering your in ground flower beds. Soil type (sandy soil, sandy soil with humus or organic material added, clay soil, amended clay soil or a combination of all) will have a lot to do with the frequency of your irrigations. In sandy soil water percolates quickly but isn’t retained well. In clay soil water percolates slowly and is retained in greater amounts. Don’t despair if your soil is less than desirable, all soils can be modified with organic materials, peat moss or other additives. Clay soils can be made more porous and sandy soils can be modified to hold more moisture. Another environmental factor that impacts watering is where you locate your garden in terms of light intensity and light duration. 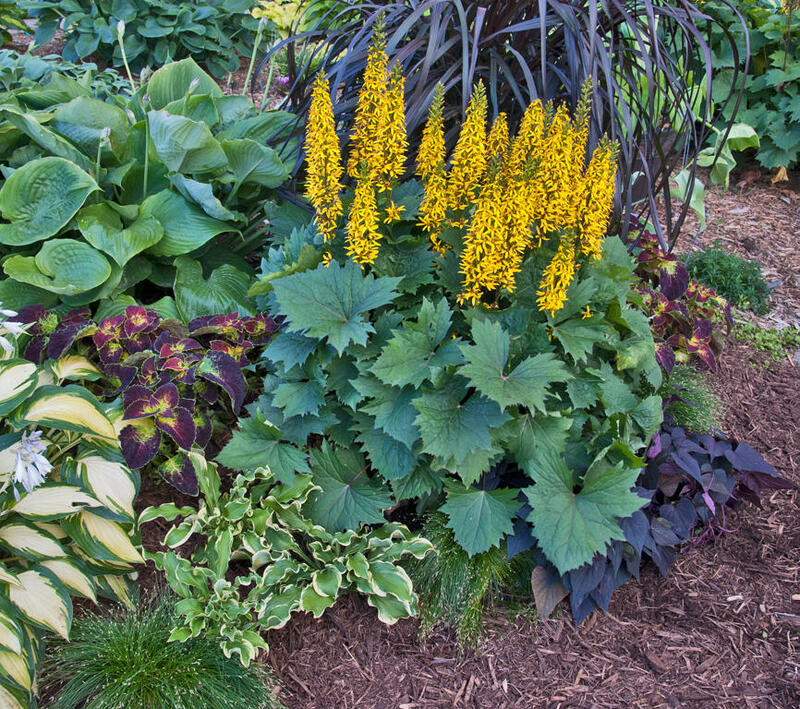 A full sun garden will need more frequent irrigation than a filtered shade garden. Note it is the frequency of the irrigation that is variable not the duration of the irrigation. When you start to prepare your soil bed each year, there are a couple things you can do to make sure your plants will thank you in the heat of the summer. Every year try to loosen the soil down to a depth of 6 – 8 inches. You don’t necessarily need to use a roto-tiller, do turn to soil with a shovel. Too much use of a tiller can actually pulverize your soil. It is also a good idea to add about 4” of peat moss and compost to your soil annually. With the soil loosened generously sprinkle a base fertilizer down. In my community 15-15-15 is readily available and very reasonably priced so this works for me. (For more information on fertilizing read “Feed Me, Seymour.”) I do not work this into the soil but figure as I plant and hoe this application eventually works into the soil. If I am using an ooze or soaker hose as my primary irrigation tool I would also bury it now that the soil is loose. I normally use an ooze or soaker hose in my vegetable garden and bury it to a depth of 6 inches below the surface. Ooze and soaker hoses can also be left on the soil surface. 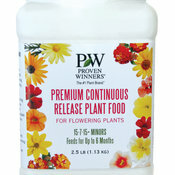 When planting, use Proven Winners Premium Time Release (or another slow release) fertilizer in each plant hole, be sure to work the fertilizer into the soil a bit since direct contact with plant roots can be harmful. This fertilizer application helps guarantee that as the new roots reach out into the soil of the flower bed they will find the nutrients necessary to grow strong plants. By now you may be wondering, “what does all this have to do watering?” Well, properly prepared soil will allow water to filter down to the root zone with a minimum of time and with maximum results. A soil that is not porous or turned will sometimes impede water percolation and no matter how much you water your plant still suffer. The single most important rule of irrigation is when you water, water well! Irrigation water needs to saturate the soil and come in contact with the roots in order for it to be taken into the plant and used for plant growth. Most root systems of flowers, vegetables, trees and shrubs should be thought of as a slightly reduced mirror image of the plant’s upward stems and branches. This root system is as wide as the plant is, and as deep as the plant is tall. You need to apply enough water to saturate the soil that holds this root system. This is why a quick 5 minute watering won’t work. Those gardeners that have problems with watering, more often than not cause root damage by frequently watering but not watering well enough to have water filter all the way through the root zone. It is far better to water well but infrequently than to water too little but often. Plants that are watered often with just a bit of water will develop a shallow root system. The plant has no need to develop a deep root system. Then if water becomes less plentiful the plant doesn’t have a deep enough root system to sustain life. Plants that are watered slow and deep will sink roots deep into the soil. This large root system allows the plant to pull water from a larger area and will be less likely to suffer if water becomes less plentiful. A good rule of thumb is to slowly water your garden (not your lawn) one inch of water a week. How do you know how long to water to apply an inch of water? Simply put a wide mouth jar or can (mark the one inch level) in your garden or use your rain gauge (if you overhead water) and turn on your sprinklers. Note what time it is when you turn on the sprinklers. When an inch of water has collected, turn the water off. Note the amount of time it took to apply one inch of water. Once you have done this ‘irrigation by volume’ in the future run your sprinklers by time rather than water volume. Try to always run your sprinklers for the same amount of time. Another way of checking whether you have applied enough water is to use your trowel or shovel and make a small slice in the garden soil and see how deep the water has percolated. You are not looking for soggy soil, simply moist soil. In moist soil you have both air spaces as well as readily available water for the plant’s roots to use. This method is necessary if you are using some kind of drip or soaker method of irrigation. It is difficult to stand there with a hose and provide both sufficient water to your garden beds and to apply water slow enough to allow all of it to soak into the soil. It is also very difficult to evenly water your garden by hand. It is best to use some type of sprinkler, soaker hose or dripper system to effectively water garden beds. Except when you are planting your garden, you should try to water in the early morning or at the latest by noon. There is a lot to be said about watering so that all free standing moisture has been absorbed either by plant or by soil at least 4 hours before darkness. Now this may be an old wives tale but it is the gospel to me. Wet plants at night are much more susceptible to fungal diseases than those plants that have no free standing moisture in the evening hours. There are exceptions to every rule. If you have to water to save a plant from death by drying go ahead and water. The immediate concern is more important than the possibility of disease. If you must water because evening is the only time you have in the garden, try to water so that the soil is moist but not the plant. Sometimes during the summer, if you have been on vacation or perhaps missed a few irrigations your garden soil may end up being the consistency of cement. Water simply will not infiltrate the hard top layer of soil. Rather than renting a jack hammer to loosen the soil, try pre-wetting the soil with a mixture of a gallon of water and a tsp of dish soap (Ivory Liquid or something similar.) Use your watering can to apply this mixture to the soil and plants. Follow the pre-treatment with a normal watering. This pre-treatment actually makes the garden soil more likely to accept an irrigation (it makes water more slippery) and able to find a path between the soil particles and into the root zone. Proper soil preparation will help irrigation to be more efficient and effective. Water slow and deep less often rather than a little bit more often. An inch a week should be sufficient for most plants. Water in the morning if possible, wet plants at night increase susceptibility to disease. I have had zero luck growing this lovely per annual although I see it flourishing in other gardens.. I live in Southeastern Ontario Canada, zone 5 and placed my clematis in a sunny location (facing east) with the base of the plant protected as directed. It has literally shriveled and died on the trellis. I am planning to try again with a new plant in a less sunny location. Any suggestions? Great question! That picture is of our Bottle Rocket Ligularia. 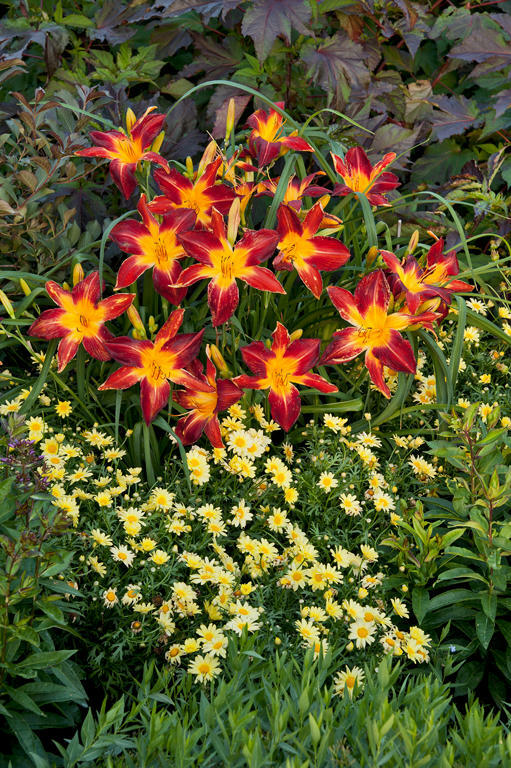 It is a perennial and hardy zones 4-9. The following link will take you to the plant details for more information and ordering if you would like to purchase it through our online store.